Picture: Rob (right) with H.E. Leon Kaulahao Siu, Minister of Foreign of Affairs of the Hawaiian Kingdom (left), and Dr. Leon Watson of Hawaii Tokai International College (back). Taken at an award ceremony for Minister Siu. Rob is an activist for Hawaiian and Ryukyuan rights, as well as rights for indigenous / First Nations people everywhere. He is the director of the Peace for Okinawa Coalition. In 2018 he was appointed by the Hawaiian Kingdom as a Special Envoy to the Ryukyu Islands and China. He is an official cultural ambassador for his ancestral village of Nakagusuku, Okinawa. Urumin, Gushikawa, Uruma City, Okinawa, November 24th, 2018. Okinawa International University – “History and Culture of Hawaii.” July 29th, 2018. ​Okinawa International University - “A Brief History of Hawaii.” May 20th, 2018. Nakagusuku Village Yoshinoura Hall - “Hawaii – Okinawan Identity.” November 24th, 2017. University of the Ryukyus - “Hawaii – Okinawan Identity.” October 27th, 2017. Henoko - "Hawaii - Okinawan Identity." October 21st, 2017. Disclaimer: Although Rob Kajiwara works in affiliation with several different organizations and non-profit groups, all of Rob's views are his own and do not necessarily reflect the views of any government or organization. Rob Kajiwara (white shirt) with the Free Hawaii campaign at Iolani Palace. With H.E. Leon Siu, Minister of Foreign Affairs. The upside-down flag represents the Hawaiian Kingdom in distress. All proceeds of the sale of the Hawaiian Kingdom Crest and Flag items go to support native Hawaiian rights. Rob presenting at Okinawa International University. 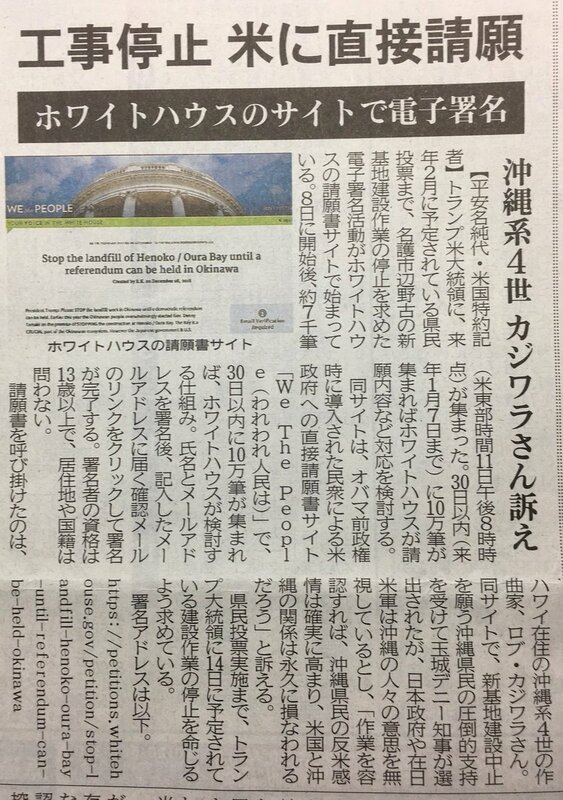 Celebrity support for Rob's petition to save Henoko, Okinawa. Ryukyu / Okinawans protesting the U.S. military presence in their home islands.